Our own trials and tribulations to establish community gardens in San Diego inspired me to see how other cities, states and islands for that matter start gardens in their communities. 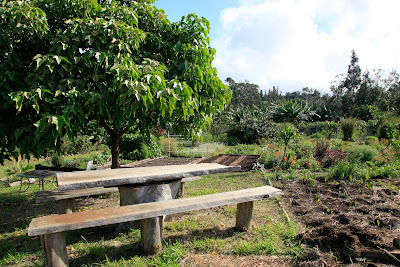 So on the recent trip to Maui we made a stop at Hali’imaile Community Garden, the first such garden to be established on the island, in 2006. 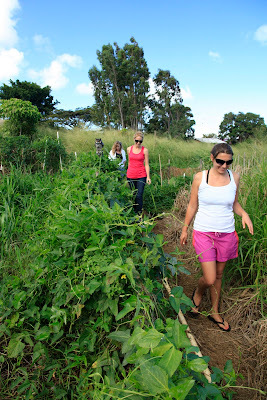 The Hali’imaille Community Garden is an unexpected gem hidden among sugarcane and banana trees. As you drive down the dirt road to its entrance you hardly know what to expect then all of a sudden the road opens up to a patchwork of lovingly tended plots. Elle was kind enough to meet us for a tour of the gardens and has been dedicating herself to this land for 2 years. Elle is a Southern California transplant that along with the additional members lends a hand in the compost bins, common areas, vermiculture and maintaining and clearing of new plots. The land is owned by the Maui Land and Pineapple Company and due to its odd shape the land was never fully utilized to grow their crops of pineapple and sugarcane even though both of those crops can be found there today. As a generous gift Maui Land and Pineapple allowed the community to utilize the land and just recently agreed to a five-year renewable lease on the property at no extra cost. Due to the private ownership of the land they were able to avoid the costly and daunting permitting process. With these exciting developments came the formation of the Maui Community Garden Initiative which “exists to proactively engage Maui communities in growing food. Through strategic collaborations and public advocacy, we provide educational and technical support for cultivating and sustaining community based gardens” The initiative is dedicated to looking towards the future as an opportunity to involve local schools and the community in educational programs centered on organic and sustainable agriculture.With these new developments the HCG has seen an increase in involvement and membership. New plots are being cleared everyday to grow the likes of Taro, Broccoli, Borage, Kale, Sugarcane and Sunflowers. The yearly costs to call a 10X20 plot your own is a mere $50.00 which takes into account your water costs and access to all the amenities, including the herb garden, fruit trees and a tool shed. 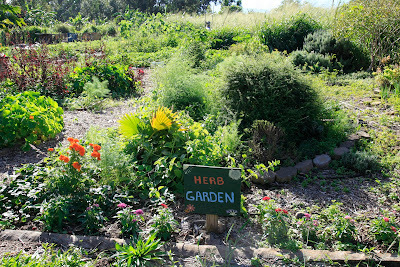 The community garden hopes to maintain the upward trend in membership through continued community events. 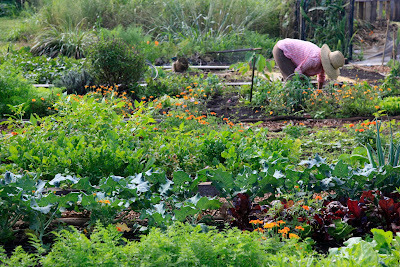 Many people often ask me if I can recommend a garden in or near their community that they could grow fresh produce in. I always say I know of several great community gardens, centrally located, but the waiting list can be up to two years long! You’re probably asking yourself how that is possible in such a perfect climate town with what seems like an abandoned lot on every corner. Well NBC San Diego put together this quick video explaining why these gardens are so rare. Basically most of these vacant lots are zoned for commercial property i.e. property that generates property taxes that go back to the city. These community gardens generate $0 for property taxes so they are essentially prevented from sprouting on commercial land. Now council members Todd Gloria and Sherri Lightner are pushing to change city zoning laws so that commercially zoned lots can become community gardens. With this change interested parties will still need to meet with the owners of the vacant land to get their permission as well as start the permitting process with the county which requires plans and a $5,000 deposit. Here are the previous application forms which are hopefully about to undergo a major face lift. Thankfully there are non-profits like IRC, Victory Gardens San Diego and One in Ten Coalition that are spearheading the movement making it easier for an individual to get involved and be heard by their government. Lend your voice and sign the petition here to let the San Diego council members know this issue is important to you. Not just two words put together, Urban Homestead is quite clearly a way of life that describes people in their respective cities who may grow their own food, generate their own electricity, raise animals and more. These people have turned their homes into a symbol of taking responsibility for their lives. With each step closer towards self-sufficiency Urban Homesteaders have pulled the veil away from the source of all they require in their lives. When we bit into our first homegrown tomato came an awakening, no longer did we have to imagine our food came from a sunny green farm on the hill, now we could know it for sure. Homegrown lettuce, strawberries, peppers, eggplant and potatoes followed. Why stop there? We tasted eggs from our own chickens and realized how they were meant to feel, how they were meant to look and the taste we had never realized we were missing. Then came composting our organics thereby limiting what we sent to landfills, making our own dairy products, collecting our first honey along with our own rainwater, as well as raising our own fish. Once we tasted and felt the difference we couldn’t be stopped. We were a force, a growing, raising, eating force that took all of our neighbors and family members by storm with our new inspiration. We couldn’t tell enough people about what they were missing. We spread the word by phone, email, text, tweet and post. This was a call not for a new and exciting movement, but for a return to our self-sufficient past. The words Urban Homestead don’t define us, no word or words could ever hope to express what we are and what we have gained through our return to a simpler life. Taking away the ability for all of us to pigeon hole ourselves with the term Urban Homestead doesn’t change who we are or what we have accomplished. I’m thankful we have come to another realization through this tribulation, one where we realize that we are not alone in this passion for what we have achieved. Our worldwide community is ever expanding in this movement to take back what we hadn’t even realized we were missing. My one hope is that you too can come to the understanding that there is little meaning in controlling a word, in losing the ability to use these words we don’t lose our abilities to continue our wonderful work. We are only further inspired to become undefinable. The term Urban Homesteading has been trademarked by the Dervaes family.